It’s time for #BakingBloggers again! The theme that was most voted for was cheesecake! I am terrible at making and photographing an entire cheesecake. I don’t know why, but every time I try it, it ends up even more amateur than my regular photographs. So I made cheesecake bars partially to avoid that, but also because it’s easier to take bite-sized foods into work for my coworkers. I think I’ve mentioned before that I rarely eat or even try the baked goods that I make. But these were just too pretty and tasty looking to pass up, so that should tell you something! 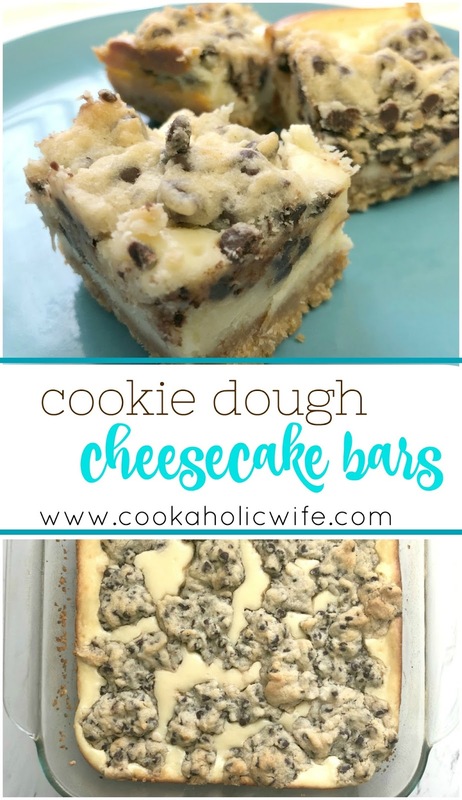 Cookie Dough Cheesecake Bars are sure to delight any sweet tooth with their graham cracker crusts, cheesecake filling and cookie dough topping. Preheat oven to 325 degrees. Spray an 8×8 baking dish with non-stick spray. In a medium bowl, combine graham cracker crumbs and melted butter together until the texture becomes like wet sand. Transfer to the prepared baking dish and use a silicone spatula to press the crumbs down into a flat, even layer. Bake for 5 minutes, then remove from the oven. Meanwhile, prepare the cream cheese filling by adding the cream cheese and sugar to the bowl of a stand mixer and beating on medium speed until light and fluffy. Add in the egg and vanilla and mix until fully combined. Pour the cheesecake mixture on top of the baked crust. In the bowl of a mixer, add butter, brown sugar and sugar. Beat on medium speed until light and fluffy. Add in the vanilla, flour and salt and mix until combined. Fold in the mini chocolate chips. 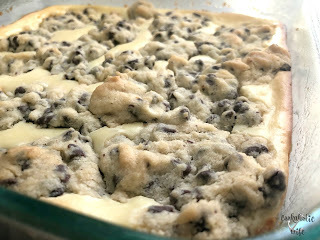 Drop rounded spoonfuls of the cookie dough mixture on top of the cream cheese mixture. Bake for 30-35 minutes or until lightly golden and a toothpick inserted in the center comes out clean. Allow to cool on the counter to room temperature and then refrigerate for at least 2 hours but up to overnight. 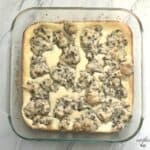 Remove from the refrigerator, slice into 16 squares and serve. Keep refrigerated if not serving immediately. 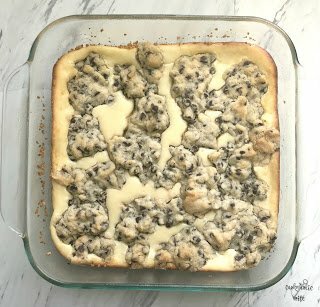 Cheesecake bars will keep in the fridge for 3-4 days. 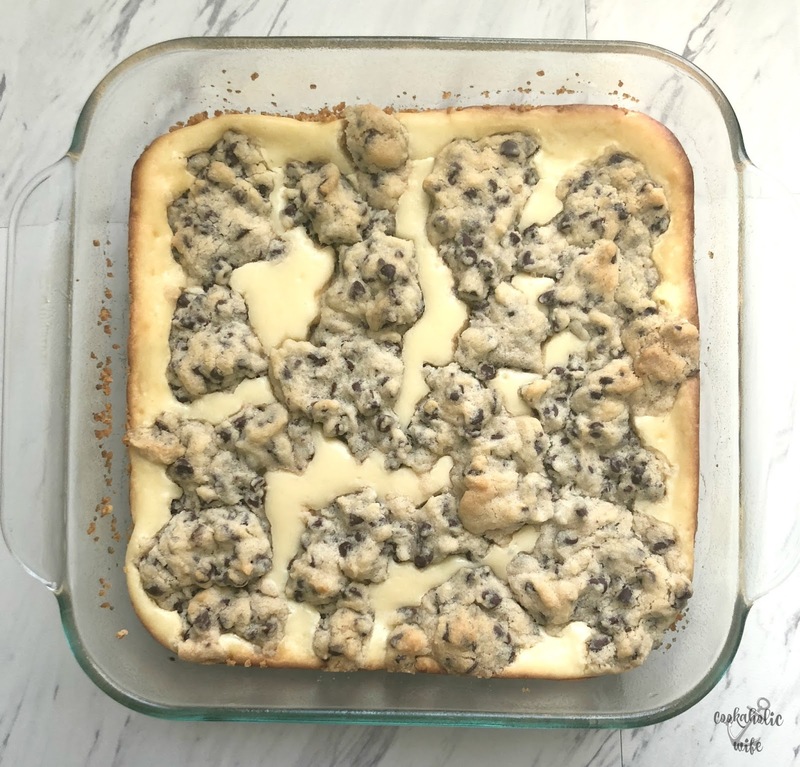 Note: Cookie Dough Cheesecake Bars should cool to room temperature, then be refrigerated for 2 hours so they can firm up before being sliced and served. Sometimes it’s hard to get a graham cracker crust to hold, but this one held up perfectly even when sliced into bars. 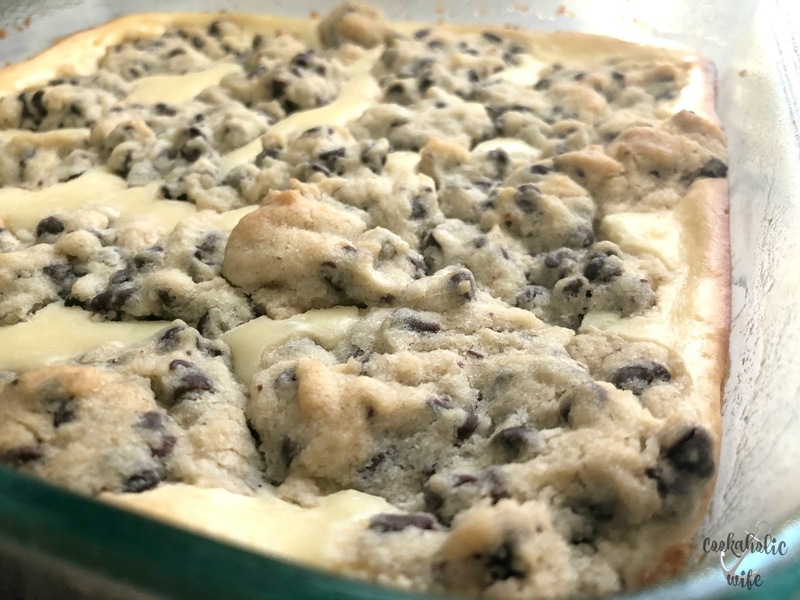 The cheesecake is light and sweet and the cookie dough provides just the right amount of crunch from the mini chocolate chips. I definitely want to make these again! My family would love these little bites. These are such a quick and easy alternative to homemade cheesecake! We used a biscuit cutter to make them into round shapes, kind of like a cookie sandwich. 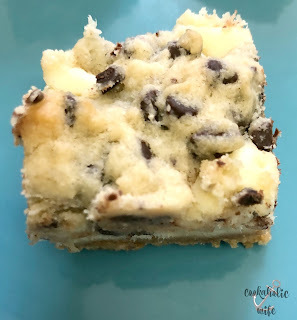 Love the idea of cheesecake bars, will have to try my hand at these sometime. But I don't think they'd last 3-4 days in our house. Perfect bites for an high tea party. What a fun recipe, Nichole! Looking forward to trying it. I bet these were a big hit at the office! Yum! Love all that cookie dough! Little bites sound perfect.